Patricia (Pat) Flinn was 15 when she moved to Stockbridge with her parents in 1959. She graduated from Williams High School and earned her BA from Randolph-Macon Woman's College. Pat started at Berkshire Life Insurance Company after graduating and worked there for more than 36 years, first as a programmer, and then analyst and manager in the IT department. In 2003, she took early retirement at age 60. 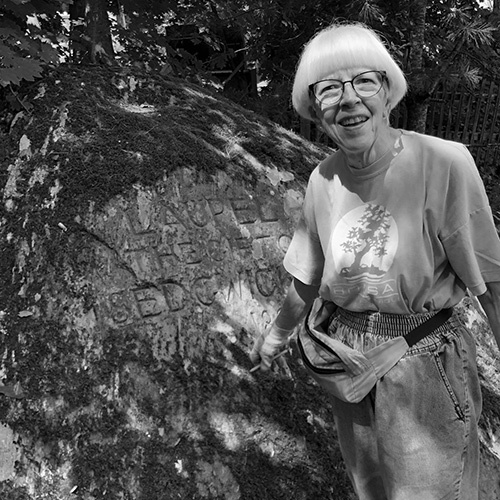 For many years, Pat served on the boards of the Literacy Network, the Bluebird Visitor's Center, and the Stockbridge Zoning Board of Appeals. She is currently a member of the Town Green Communities Committee, a tutor for the Literacy Network, a volunteer at the Stockbridge Library Museum & Archives, and is on the executive board of the Williams High School Alumni Association. Her longest affiliation has been with the Laurel Hill Association, where she has been on the board for 35 years, the last 32 as Recording Secretary. Pat thinks this is fitting, since her Park Street home abuts Laurel Hill Park, and is down the street from the Mary Flynn, Ice Glen, and Laura's Tower trails.